So began a journey, in 2014, to choose seven pianos from all corners of this country. They offer a rich, kaleidoscopic view of Australia's colonial history involving famous artists, Afghan cameleers, Aboriginal history, and morse code. The chosen pianos are by no means exhaustive or exclusive. They still exist today and their cultural, historical narratives have served to inspire new works by fourteen composers from Australia and Germany, where most of the pianos originated. The colonial piano is the inspirational 'muse' for these composers because it remains a poignant and significant symbol of colonial Australia. The piano absorbed the shock of Western settlement in an alien land. It was a salve, a rare constant in a life that was terrifying in its rawness. As a symbol of high art, the colonial piano created a buffer between settlers' ideals and the reality of their cultural dislocation. 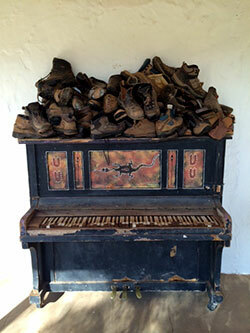 A piano at the Glen Helen Resort in NT. The piano pervaded every hall and church, and almost every household in colonial Australia. The advent of the industrial revolution ensured that the piano remained a cheap commodity, affordable to most classes. An estimated 700,000 pianos existed in Australia in 1888, with a population of 3,000,000. The introduction of camels and Afghan cameleers in Australia during the colonial period enabled their transport to most areas of the Australian terrain. It is what the history of these pianos reveal as much as what they conceal, that informs the various composers' works. Elena Kats Chernin's Piano Memories is an evocation of unadulterated love for the piano. It reflects inspiration on many levels - for the piano, for her friendship with Gabriella and for the love of making music. The three movements reflect the Telegraph Station piano, from its travels across the desert on the back of a camel, to the lost waltzes played on it, to its present day muted silence. James Rushford's Damp Antiquary is inspired by the idea of the instrument as somehow 'haunted', where past musical memories manifest on the instrument of their own accord. Inspired by Robert Louis Stevenson's piano, Cathy Milliken has entered into his unique sound world through steel-true gold-sole. Her work incorporates Stevenson's music and text-making, set in the context of the South Seas. The flageolet is, in a sense, an acoustic snapshot, as indeed the sounds of the second, colonial, piano serve as an acoustic memory. My heartfelt thanks to Jon Rose for suggesting this project. I'm inspired by the extraordinary creativity of the composers involved in 'Of Broken Trees and Elephant Ivories'. They've created a living history, revivifying the colonial piano and recontextualising its importance as a cultural object through their music in ways I could never have envisioned. The next performance of 'Of Broken Trees and Elephant Ivories' will take place at a private 'An Evening at Peggy Glanville-Hick's House' concert in Sydney on 19 June (drop us a line for further information). After the music, Gabriella will discuss the project with ABC Classic FM's Stephen Adams. The event will be recorded and made available on the ABC Classic FM's New Waves podcast at a later date.